The soul and the spirit: One often looks foolish, and it might not be the one you think! More on that later. First, what is the difference between them? 1 Thessalonians 5:23 – And the very God of peace sanctify you wholly; and I pray God your whole spirit and soul and body be preserved blameless unto the coming of our Lord Jesus Christ. God tells us that there is a difference between the spirit and the soul. Have you ever heard someone say “you will feel it in your spirit” when what they really mean is “you will feel it in your soul”? It is probably fair to say that for most people, the difference between the soul and the spirit is not that clear-cut. Even Christians are not always sure as to whether there really is a difference to begin with. And even if there was one, most of us do not really grasp it. I will not pretend that I understand fully what the spirit is, but I hope some illustrations will help us wrap our minds around it. The mind (our intellect, where our reasoning takes place) is a major part of the soul, so I will take it that understanding the difference between the mind and the spirit will set us on a good path to understanding just how different the spirit is from the soul. We will inspire ourselves from nature on one end, and we will look at a few examples of actions directed by the spirit. I was at a zoo not too long ago where I took the picture of the tiger you see here. Thankfully, there was a “very” thick glass separating us. This tiger, like the crocodiles and the many other animals I saw that day has a strength that far exceeds mine. Without the glass separating us, I simply would not stand a chance in a physical combat (if there is even one to begin with). Yet I thought “I, a man, was able to lock this tiger in a cage. And I also caged all the lions, the crocodiles, and even some elephants in that zoo. I did all this so that others can come and look at them”. Then I thought, “what is it that I have that allows me to dominate all these animals?” A mind of course! I can think, I can reason, they cannot. Then I thought “if only he could, I am sure this tiger would give all its strength in a heartbeat just to get a piece of my mind”. Why? Because no matter how strong he is, his power cannot even begin to be compared with mine, the power of my mind. How much more powerful is the mind compared to the body? I cannot even begin to measure how much powerful it is! The mind is simply on a whole different level, a level that is far superior to the body. It is also in a completely different class. No amount of bodily exercise can develop a mind. Either one has a mind (and is therefore able to benefit from its power) or one does not. Well, think of the Spirit! It is at least that much more superior to the mind. God is Spirit so His ways and thoughts are spiritual. The mind of a man is really what defines him (Proverbs 23:7), so his ways and thoughts are of his mind, his intellect. That is how he reasons. Here in Isaiah, God tells us that the spirit and the mind operate on two vastly different levels, the spirit operating at a “much” higher (understand by that “much more powerful”) level than the mind. No amount of mind exercise will ever develop a spirit. And no matter how intelligent we are, the power of our mind will never be comparable to the power of the spirit. They are in two different classes! Understanding the context of this verse, a natural man is one who does not operate with the Spirit of God. To the best of my understanding, by “natural man”, 1 Corinthians 2:14 refers either to anyone who does not have the spirit, or anyone who has the spirit but does not operate from it. The natural man is one who operates solely from his mind (or worse, his body). God says that such a man “cannot” accept the things of Spirit because they are foolishness to him. He “cannot” even understand them! Wow, what is so special about the spirit that even the smartest among us cannot understand his things?? 1st illustration: How about spitting on dirt? Now, you tell me, how is 1) spitting on the ground, 2) making clay out of it, 3) applying that clay on someone’s eyes who is completely blind, and then 4) sending that person to go wash in some pool a recipe for healing blindness from birth? In what medical journal do you think you will get published for promoting such a formula? Will your formula ever receive FDA approval? How can the medical industry accept or even understand this recipe??? Yet, the result is there…this man came back “seeing”! This is an act of the Spirit. And for the mind, this is pure foolishness! 2nd illustration: Would you call this a military strategy? Now the whole record of the battle of Jericho under the leadership of Joshua is a bit long (Joshua 6:1-27) for this blog. But essentially, God instructs Joshua and his military officers to march around the city of Jericho for six days. And on the seventh day, they were supposed to march around the city seven times, blow the trumpet, and shout. The expected outcome? The wall of Jericho – a fortified city – was supposed to fall down flat! Well, Joshua and his men did it, and the wall did fall flat! How do you like this for a military strategy!? What is sure is that you will not be getting any stars for devising such a strategy for battle…it is pure foolishness! Check the secular literature on this account, and you will see how scientists and military strategists of all sorts are puzzled by it. And most of them simply cannot accept that it actually took place! Looks like 1 Corinthians 2:14 is verified once again, these acts are foolish for war! But these are acts of the Spirit, because these men acted on the directives of God. There are many more examples. How about the partying of the sea with Moses, Jesus walking on water, people being healed from Paul’s handkerchief, or Jesus feeding thousands of people starting with five fish and a piece of bread? And these are just a few! It is futile for the tiger to think that he can accomplish with its physical strength what can only be accomplished with the mind. Likewise, it truly is futile for us to think that we can accomplish with the mind those things that can only be accomplished through the Spirit. These illustrations show also just how much we are missing when we do not operate by the spirit: We cannot understand the things of God, and we certainly cannot perform the things of the spirit. We need the spirit of God to accomplish the tasks God has given us. We need the spirit of God and we should dictate our own mind to subject itself to the immensely superior power of it! It is only then that we will see the acts of the spirit. 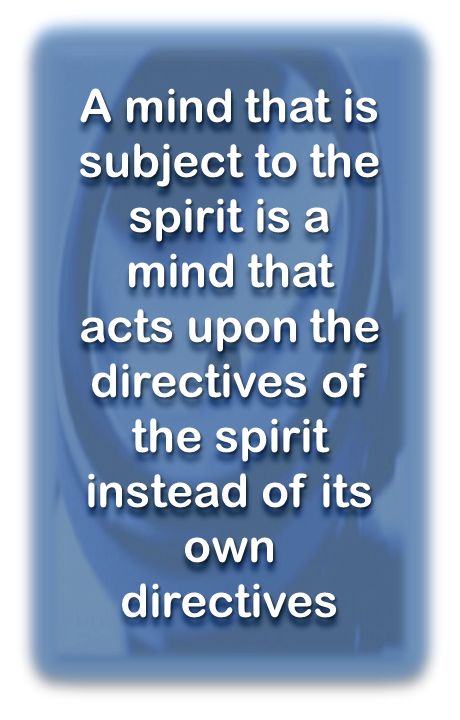 A mind that is subject to the spirit is a mind that acts upon the directives of the spirit instead of its own directives. We will look very foolish at times to outsiders (Jesus certainly did when he spat on the ground), but at the end, we know who will get the last laugh! Praise the Father and His Son Jesus-Christ. I will rather be foolish in the eyes of the world than in the eyes of my Lord! True, Tongues Shall Cease. But Have They Already?